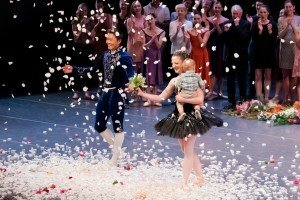 For some editions of Pacific Northwest Ballet’s end-of-the-year summary show appropriately entitled Encore, the focus is on presenting a Whitman’s Sampler of choreographic highlights, and in some years the focus is more on honoring Company members who are leaving for various reasons. I knew going into it this time that the focus would be on paying a well-deserved tribute to Principal Dancers Carrie Imler and Batkhurel Bold. And what a show it was! Beginning with the opening section of Balanchine’s wonderful and iconic Theme and Variations (set to the final movement of Tchaikovsky’s Suite No. 3), the audience cheered and clapped forever when the curtain went up on Imler and Bold posing in perfect fifth positions, backed by a tight corps de ballet. These cheers were for both the supreme elegance of the opening formation — which distills ballet to its essence — and for its lead dancers. 3 Movements by Benjamin Millepied was on the bill, and the program notes revealed that Bold was in its original 2009 cast. His was a nice tribute, but with Rachel Foster and Jerome Tisserand in the lead parts. Twyla Tharp is at her sardonic choreographic best with the “Something Stupid” section from her Nine Sinatra Songs, first made in 1982. 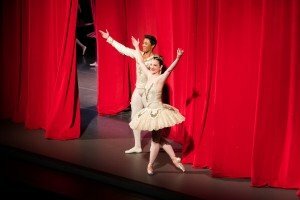 It’s a silly take on ballroom manners and style, and it was totally fun enjoying Imler and Jonathan Porretta reprise their roles from PNB’s premiere of it in 2006. It takes great artists to make comedic ballet come across well — timing, timing, and timing, and these two just nailed it, not holding back and every bit was as amusing as intended. I’ve thoroughly enjoyed Kent Stowell’s Cinderella since its 1994 premiere. Everyone adores the all-red costumed waltz of Act II’s opening. The program notes provided that Bold made his Prince debut in 2011 and later danced with his wife, Lesley Rausch, in 2012. Both reprised the concluding pas de deux. Glittery confetti rained down as the curtain rang in. Lovely. Truly. Porretta and Imler were back at it — for the last time (?) — in a Pièce d’occasion made for them by colleague Kiyon Gaines called “Folly” à deux. This work, set to an overture by Philip Glass, prolifically demonstrated what they can each do together and separately — which is a lot. Somewhat in the post-Balanchine/William Forsythe vein, it was a bravura yet “fun” duet, with quick moves and sharp poses — an interplay in the best ballet mode that allowed them to show off without having to be too high-art. Christopher Wheeldon’s Carousel (A Dance) is filled with tiny detail that fleshes out the bigger picture of a musical that tackles difficult subjects, including suicide (carnival barker Billy Bigelow), who later then looks down upon his daughter from heaven. Wheeldon focuses on the two lovers — Bigelow and Julie Jordan finding each other at a carnival with the titled carousel being cleverly depicted by the dancers — women on the men’s shoulders, in a circle, carrying poles and showing the up and down motion of their “horses.” Sarah Ricard Orza and her real-life husband Seth Orza were superb in the pas de deux set to the famous “If I Loved You” music. PNB’s large cast has rarely looked better — tight, clear, and in the moment. Of course, what I was really secretly waiting for all along was for Imler to power through her famous turns. It was smart to program the Black Swan pas de deux and coda from Swan Lake as a just end to the bill. Again, to much cheering and applause, Bold and Imler were superb in the opening entrance, adagio, and then as fireworks go off during the coda — Bold for his ample “air time” and Imler for her brilliant and consistent single and double fouetté turns (with arms up in a V during the doubles), really whipping around — then giving some of the most rapid unspooling chainée turns you can imagine — knees and legs tight together and her head spotting around as a whirling dervish. About a third of the way into the program, one of the best ever film tributes was shown. Created by Sandy Barrack, it highlighted the two careers, beginning with cute childhood pictures and informative captions and text. It smartly spliced together his coupé jeté into a seemingly wonderful endlessness (did he ever come down to earth?) and her fouetté turns culled from various ballets. Wonderful! The light on stage went up for the final time, as colleague after colleague came in one-by-one to thank, hug, and pay homage to this excellent pair. Among the last were Stowell and Francia Russell — she carrying the biggest bouquet you’ve ever seen and then a petite woman (who I believe to be Bold’s mother) curtsying at him and then jumping up into his arms (she is also a dancer, be assured). These were wonderful and heartfelt moments, an evening that paid appropriate tribute to a pair whom I will miss seeing on stage. Thank you, Carrie and Bold!